Looking for something a bit more solid than a third-party benchmark? We can do that. 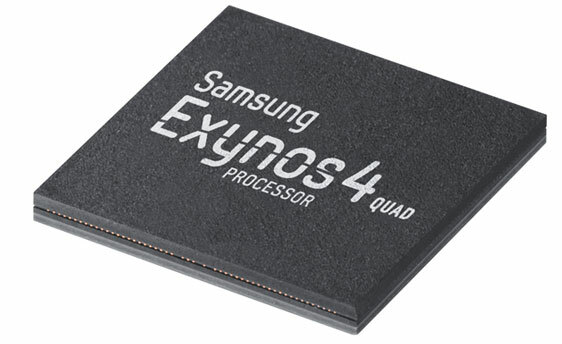 "Already in production the Exynos 4 Quad is scheduled to be adopted first into Samsung's next Galaxy smartphone that will officially be announced in May," the horse's mouth reveals. Samsung boasts that the new 32nm 1.4GHz quad-core processor flaunts twice the processing power over its predecessor, thanks to its High-K Metal Gate (HKMG) low-power technology. The net energy savings? About 20-percent. "The application processor is a crucial element in providing our customers with a PC-like experience on mobile devices," explains Hankil Yoon, Senior VP of Product Strategy Team at Samsung, "Samsung's next Galaxy device, which will be officially announced soon, offers uncompromised performance and ground breaking multitasking features, thanks to Exynos 4 Quad's powerful performance and efficient energy management technology." Sammy says it's shopping the new processor around to other handset manufacturers (like Meizu), noting that the Exynos 4 Quad is pin-to-pin compatible with the Exynos 4 Dual (the brains behind the Galaxy S II and Note), which gives designers the ability to update product designs with minimal costs. Check out Samsung's full press release after the break. SEOUL, Korea--(BUSINESS WIRE)--Samsung Electronics Co. Ltd., a world leader in advanced semiconductor solutions, today introduced the industry's first quad-core application processor built on the High-k Metal Gate (HKMG) low-power process technology. With unprecedented performance capabilities exceeding 1.4GHz based on the ARM® CORTEXTM A9 quad-core, the powerful, yet energy-efficient Exynos 4 Quad, allows system-level architects to integrate maximized power efficiencies into smartphones and tablets which enables double the processing power at a 20 percent lower power bill over its predecessor, the 45nm process-based Exynos 4 Dual.